A sugared version of RottenPotatoNG, with a bit of juice, i.e. 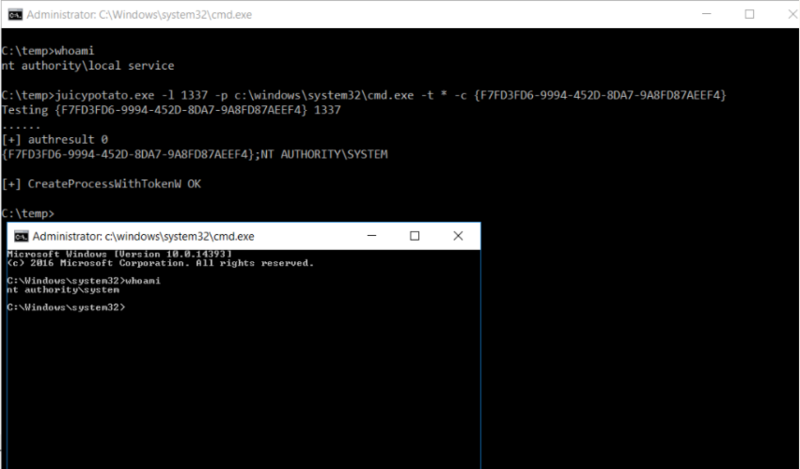 another Local Privilege Escalation tool, from a Windows Service Accounts to NT AUTHORITY\SYSTEM. RottenPotatoNG and its variants leverages the privilege escalation chain based on BITS service having the MiTM listener on 127.0.0.1:6666 and when you have SeImpersonate or SeAssignPrimaryToken privileges. During a Windows build review we found a setup where BITS was intentionally disabled and port 6666 was taken. We decided to weaponize RottenPotatoNG: Say hello to Juicy Potato. For the theory, see Rotten Potato - Privilege Escalation from Service Accounts to SYSTEM and follow the chain of links and references. After some testing we obtained and tested an extensive list of interesting CLSID’s on several Windows versions. pick any CLSID you want. Here you can find the list organized by OS. If the user has SeImpersonate or SeAssignPrimaryToken privileges then you are SYSTEM. It’s nearly impossible to prevent the abuse of all these COM Servers. You could think to modify the permissions of these objects via DCOMCNFG but good luck, this is gonna be challenging. The actual solution is to protect sensitive accounts and applications which run under the * SERVICE accounts. Stopping DCOM would certainly inhibit this exploit but could have a serious impact on the underlying OS. An automatic build is available. Binaries can be downloaded from the Artifacts section here.